With it, you can free download online videos from various video-sharing web sites like YouTube, Fox, BlogTV, MySpace and so on. It is easy to use as it can auto capture URL of playing online video as long as running the program. 2. Open the website form Foxreal Video Website Library or directly type in the URL. 3. The program starts to capture URL automatically. 4. Select the URLs and click "Download" icon to start downloading. 5. Find the downloaded FLV on your PC by clicking "Locate". 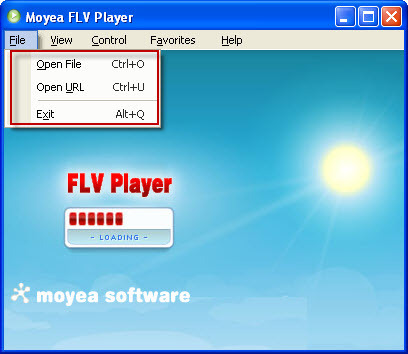 It can play all kinds of FLV developed by Adobe Company. Moreover, it is very simple to operate. F4V can be played very well in this FLV player. In addition, you are able to capture a still picture as the thumbnail and play video with full screen mode. Click “File” button in main menu. Choose the method to view online FLV of “Open URL” or view local FLV of “Open File’. This is a totally free program yet powerful FLV editing tool. With it, you can edit all kind of FLV files in timeline including F4V and MP3 and keep the original video quality. You can see the key features of the software: Edit F4V, MP3 and FLV files encoded with H.264, H.263, Flash 8, or Flash 8 with alpha. Extract FLV audio or video. Or replace the original FLV audio. Trim FLV/MP3 to get the desired duration. Merge several FLV files into one. Trim blank to get a whole clip without breaks. Short-cut keys help to edit FLV more freely and precisely. Generate SWF and HTML files for uploading online. Convert MP3 file to FLV without any quality loss. Get MP3 files from FLV as long as the original audio codec is MP3. You can know more detailed editing operating process here: http://www.exp-flv.com/flv-editor/guide.html. You can know how to cut the FLV into small pieces, join multiple FLV together, replace the audio by clicking here. FLV to Video Converter Pro 2 (Shareware). This program can convert FLV or F4V to MPEG, AVI, MP4, MP3, 3GP, WMV, MOV and even FLV encoding with H.263. Apart from the conversion function, it can also trim and crop the video, add the picture or text as the watermark to protect the own video and adjust the video quality. Step1. Import FLV or F4V to the software by clicking "Add FLV". Step2. Choose the required format for output in "Export Format" box. Step3. Specify output folder in "Export to…." by clicking the folder icon besides. Step4. Click "Convert" tab and hit "Start" to begin converting. Step5. Find the converted files in the specified output folder. When you import an F4V file, the problem will give you a prompt that you are importing F4V which requires transferring to FLV to save on your PC. Click “OK” to input F4V into the program successfully. Then you can configure the settings for output. F4V is the trend of the development for FLV files. Therefore, do not hesitate and just download these useful programs for F4V. They will rich your media life. Come on.